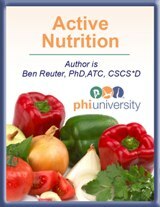 This online course will provide the fitness professional with a basic overview on nutrition for the active individual. There are eight narrated presentations on the key components of nutrition, a voluntary activity and a quiz. There are also PDF files of the slides for each presentation. The information in this course is not meant to supersede consultation with a Registered Dietician (RD), but rather to provide health and fitness professionals with the basics of nutrition for the active individual. Provide an overview of nutrients individuals ingest in their food. Provide the basic concepts behind nutritional goals for active individuals. Provide insight into how active individuals should eat and drink before, during and after activity. Online course enrollment expires 1 year from date of purchase. Upon 1st login you will have 30 days to complete the course.